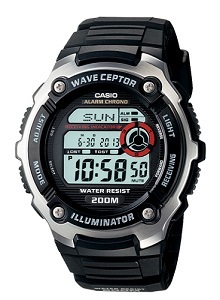 Self Adjusting Atomic Timekeeping performance in Multi-task 200M Water Resistant cases. In addition to Atomic Timekeeping, stopwatch and alarm timer functionality, the large LCD readout has the capability of displaying the day of the week in 9 different languages (ENG, ESP, FRA, POR, DEU, ITA, CHN, PYC, JPN). Couple this with 48-city world time, 12/24 Hr. formats and you'll be ready to travel the globe.